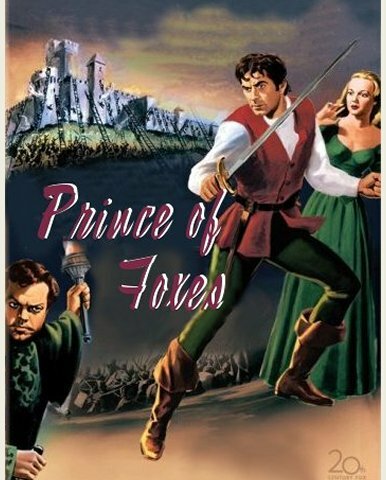 Alfred Newman scored many films starring Tyrone Power, including the beautiful one for Prince of Foxes. Others were The Mark of Zorro, Son of Fury, The Black Swan, and Captain from Castile. Preparation for the filming of the movie took over a year. Shooting extended over a year. Filming took place in Italy, in various locations around Italy to match the history of the film. The Prince of Foxes crew traveled from Rome to Florence, Rimini, and the Republic of San Marino, to get their shots. Ariadna Welter, Ty's new sister-in-law, had a bit part in the film. Leon Shamroy, top artist at 20th Century-Fox did the cinematography. His work was nominated for an Oscar. The screenplay, written by Milton Krims, was based on the novel by Samuel Shellabarger, who also wrote Captain from Castile. The film was directed by Henry King, who directed many of Tyrone Power's films. This was number eight.